Check out these useful tips for buying used cars in India. These used car buying tips will help you find a good car. The Indian car market has grown many folds in last three decades. And now, cars have turned out be a neccesity, especially in the urban regions. It is not only the new car market which is on boom at present, but also the used car market that has witnessed a remarkable growth. As per the sources, the pre-owned car or used car market in India is expected to grow at a steady pace of 15 percent and is likely to touch the business of Rs. 2,50,000 crores or 6.6 million units by year 2021. Five years back, the ownership cycle of a car accounted for around 6-7 years which currently is around 4 years and is expected to further reduce to 3.5 years by 2021. When there is so much happening around in the used car market the purchase of a used car for a commoner has become a bit knottier task. Although many used car players have evolved but still there are many flaws a used car buyer has to witness. So, to simple the process of buying a used car, we have listed below some of the most important used car buying tips, check it out. When you plan to buy a used car, the first step is to plan the budget. Before rushing in search for a good car, spend some time in planning the budget for the car purchase. Here many factors have to be considered such as for what purpose the vehicle is going to be used, how long will you keep the vehicle, how will you plan the maintenance and repair costs etc. Once you are done with planning your pre-owned car purchase budget, decide which particular car model you are going to buy. You might consider opting a used car which suits your personality or lifestyle. Be futuristic about the car needs and lifestyle changes. 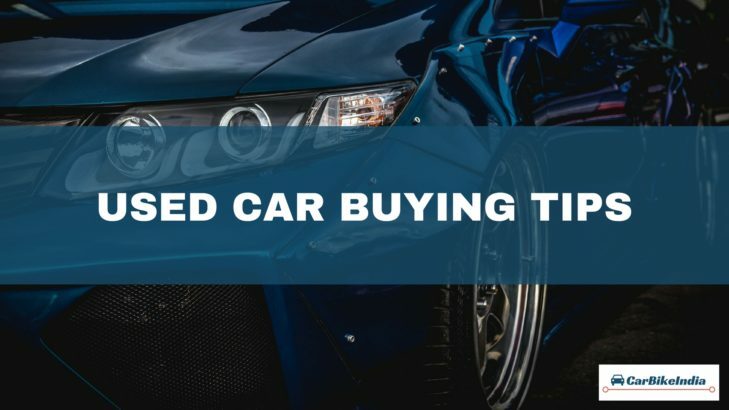 Compared to the new cars, buying a used car turns out to be a little difficult job as there are multiple choices for every single model available in the market. The best used car decision making approach is to talk to your friends and relatives who own the car model which you are planning to purchase. Spend some time in searching a well-mainted car. Today, there are so many internet platforms available that sell verified used cars in India. You can approach them, or else, you can visit OEM car brand showrooms as they sell cars in exchange of used cars. So chances are that they might have a good collection of used cars. Plan buying a used car around festive season in India i.e. around Ganpati, Navratri and Diwali. Usually people upgrade to new cars during this time so probability of find a good car during this particular time is very high. Also make sure that you buy a used car of a brand which has widespread service and dealer networks. This will help you in long run by making the car servicing hassle-free and cost effective. Avoid buying phased out cars as their spare parts are not easily available. Vehicle inspection both from outside as well as inside is very important. Inspect the exteriors carefully and look for the signs of an accident like dents or new paint. Open the hood and check if it shuts properly. Also check for the rust on the vehicle and pay attention to the cracks in the frame, welding and rusting. Take a look at the condition of tailpipe, exhaust components and muffler. Press the car corners to check the shock absorbers. If you find that the car is bouncing up and down, it means that the car shocks are worn. Also ensure that all the tools including jack and the spare wheel are in perfect condition. Don’t forget to examine the tyre tread depth. If you find that the tyres are worn, negotiate the cost of the tyres while closing the deal. You also need to pay attention to the internal components of the car. Open the hood and see if the hoses and belts are in perfect condition. Ensure that the battery is in perfect state and ask the owner when was the last time the battery was changed. If the car you are planning to buy is 3 – 4 years old and the battery has not been changed ever, very soon you are going to bear that expense. Negotiate on the battery price as well while closing the deal. Check the engine oil level by pulling out the dipstick and also check if it’s dirty. You also need to look over other parts and accessories like ORVMs, lights, seatbelts, functioning of music system, horn, AC cooling and heating efficiency, and the condition of windows. Make sure that the locks function well and the windshield washer is in right state. Also scrutinize the odometer, and if you find that the meter has been tampered, don’t buy that particular car. This is the most cruicial part. Take the car out for a test drive as it will give you a better feel of the car. Regular drivers can easily detect driving issues. Observe the functioning of the vehicle suspensions and check if the engine sounds noisy or silent. Check the condition of the brakes and gears, and see how well the vehicle runs. It is good to take a mechanic along with you to inspect the car as he is an expert in identifing suspecious cars. Ask the mechanic to check the state of the engine as everytime the condition of the engine cannot be judged with the number of kilometers the car has run. Stand behind the car and let the mechanic press the accelerator, and if you identify black smoke coming out, chances are that the engine is not in the right state. Remember, that you are spending a lot of bucks in buying a pre-owned car. Don’t hesitate to ask for the car’s service log. This will help you to understand if the car has been serviced at regular intervals, if it has a major mechanical fault or and if it’s an accidental car or not. Go through the documents of the car. Have a look at the original RC, PUC certificate and Insurance Papers. Avoid buying the car if the above mentioned documents are not provided by the car owner. Once you’re satisfied with the vehicle inspection, try to negotiate the deal. There are various used car price calculators available online so cross-check the lowest and highest amount to be paid for the used car you have chosen, and then bargain. Hope these used car buying tips will help you find a perfect car, stay tuned for more car and two-wheeler tips and reviews.